Bruno Rousselet was formerly the Science and Technology Attaché for the French mission in Slovenia, with an office at the French Cultural Institute on Breg in the centre of Ljubljana. Here's what he had to say about his position, adjusting to life in Ljubljana and travelling around Slovenia in his free time. I grew up on my family’s farm in a small village 10km from Dijon in France. After that I completed a 6-year Master's programme in the field of environmental sciences in Toulouse in the southwest of France. How long have you lived in LJ? I have been living in Ljubljana for one year - near the Dragon Bridge. I share a flat with four flatmates of different nationalities (Swedish, American, Slovenian, German) and I really appreciate the mix of all our cultures and habits. Had you ever lived abroad before you moved to LJ? Before moving here, I always was in France because I had to finish my studies. It would have been possible to live in Bergen, Norway as an Erasmus student but I didn’t do it (I know, it was a big mistake!). Why did you choose LJ? To be honest I didn’t choose Slovenia, I just applied for a job offer on the website of the French international volunteer programme and I was attracted by the missions that were offered. I didn't have any preferences for a specific country - just living abroad was enough for me. And I think I was lucky because LJ is a really nice place for a first experience out of France. Not so far away, a safe town and a high quality of life. What are the biggest differences between Dijon and LJ? The spicy taste of the gorčica (mustard) is a big one! Seriously, the biggest difference with Dijon, which is almost the same size as LJ, is that it’s more complicated if you want to get to the centre, and in LJ you can do everything by bike - I love it. I have a car here but I never used it. No traffic jams to deal with, no stress, no gas and in 5 minutes you are everywhere.If you drive for two hours from Dijon you will still be in a flat countryside, but as you know if you drive two hours from Ljubljana it’s something really different, amazing landscapes. Honestly I was impressed about what you can see and visit at the weekend. What has been the biggest surprise about living abroad in general and in LJ in particular? The language. I know it seems logical and stupid, but I never realised that abroad you have to learn a new way to communicate (my English wasn’t really good). There is a huge difference between being aware of this and being in front people who can’t understand any words of your native tongue. But when you don’t have the choice, you always have to adapt.Concerning Ljubljana, Saturday afternoons were my first cultural shock. In France it’s the shopping day of the week and here it’s the empty day of the week. But it doesn’t matter for me because at the weekend I prefer to travel to the Slovenian countryside or abroad - I need a break before the new week begins! What exactly does a Science and Technology Attaché do? My position involves developing scientific cooperation between French and Slovenian laboratories. I am responsible for helping interested parties meet an adequate partner, arranging meetings and, if it’s necessary, paying them for their travel expenses. I also have to coordinate both bilateral and multilateral cooperation related to science and technology issues.I am also in charge of promoting study abroad programmes in France with the support of our partner CampusFrance. This part consists of informing Slovenian students about the different opportunities study in France, and in certain cases awarding them a scholarship from the French government. It’s a great opportunity for those who want to have a double degree (French and Slovenian), improve their level of French and of course discover a bit more about French culture and way of life. 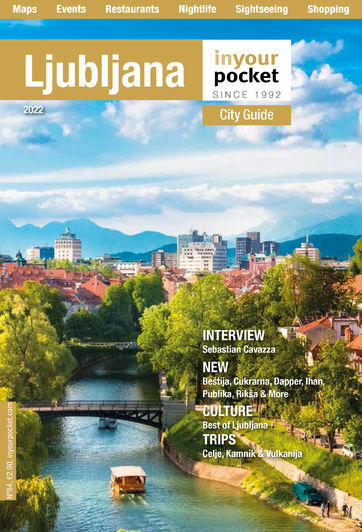 What is the main role of the French Cultural Institute in Slovenia? The role of the French Cultural Institute is to support French culture, sciences, studies and language abroad, and to cooperate with local people, artists, associations, universities and laboratories. We have a cosy library full of interesting things (DVDs, CDs, comics, newspapers, etc) and it’s possible to study the French language with professional teachers, as well as to obtain an official level of French two times per year. Any favourite restaurants? Bars? Clubs? Honestly my favourite restaurants were always in the countryside and especially a cosy Gostilna in the middle of nowhere after hiking just surrounded by mountains. In Ljubljana I am used to eating a nice kosilo at Julia or a spinach pizza at Trta. When it comes to bars and clubs I am not fan of the trendy places, so some of my favourite places are Gala Hala and Jalla Jalla in Metelkova, the ethno bar Zlati Zob and sometimes Irish Pub. What are your favourite places in Slovenia? There are many great places to see in Slovenia, but for me nothing beats the roof of my building. It is the 15th floor without any obstructions and has a perfect 360 degree view of Ljubljana, the countryside and the Alps in the distance. Really amazing! What is your best moment in Slovenia? And the worst? The best was experiencing the first sun ray after four months of harsh winter.The worst will when I have to give up my bike before I leave. How much longer do you plan on staying in LJ? Where's your next destination? Sadly, by the time this article is published I will have already moved from Slovenia. If everything goes according to plan I will shortly be in Congo Brazzaville, overseeing the construction of a waste storage site for oil companies. This will obviously be quite a change from Slovenia, but I think Ljubljana has been a really nice first step before many other travels.